Exhibitors on the tour appreciated the first-hand look and affirmed the value of the show to reach customers. 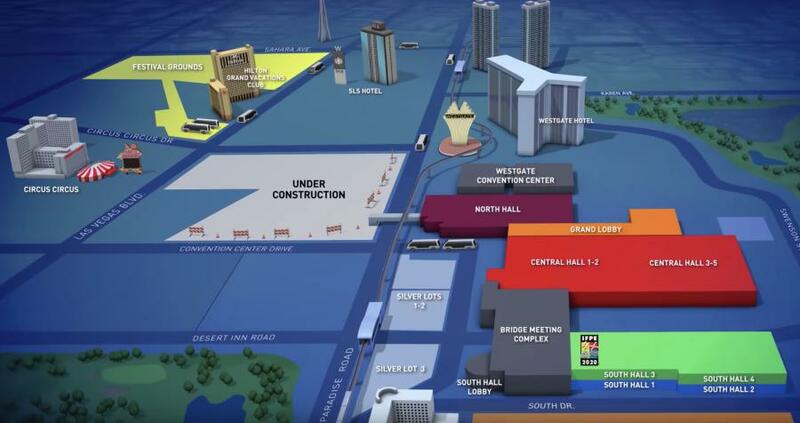 CONEXPO-CON/AGG is expanding the 2020 show footprint to include the Las Vegas Festival Grounds, located on the Las Vegas Strip adjacent to the Circus Circus Hotel. Show Management recently conducted a tour of the space for exhibitors and created a video for companies unable to attend. “The Festival Grounds provides exhibit space and show services that our exhibitors and attendees will be very pleased with,” said Dana Wuesthoff, AEM vice president of exhibitions and event services and show director for CONEXPO-CON/AGG. Wuesthoff explained that the CONEXPO-CON/AGG show planning committees are developing comprehensive plans to ensure connectivity between the Las Vegas Convention Center and the Las Vegas Festival Grounds to help attendees and exhibitors easily navigate all areas of the show to most effectively conduct business. The 2020 show-connected campus will include new and expanded transportation, attendee experiences and registration locations. Features will include multi-site drop off locations for shuttles, complimentary monorail passes, golf cart shuttles and various experiential transportation options. CONEXPO-CON/AGG is North America's largest construction trade show representing asphalt, aggregates, concrete, earthmoving, lifting, mining, utilities and related industry segments. CONEXPO-CON/AGG 2020 will take place March 10-14, 2020 in Las Vegas. Association of Equipment Manufacturers (AEM) is show owner and producer. To keep up with what's new at CONEXPO-CON/AGG 2020 and the construction industries, visit http://www.conexpoconagg.com/subscribe/.